Caring Homes Group scooped two awards at the south-east regional finals of the National Apprenticeship Awards 2018 this week. The care home provider picked up the award for Macro Employer of the year and Recruitment Excellence. An accredited national provider of care support and accommodation, Caring Homes Group employs more than 5,600 people of which 358 are apprentices covering a number of disciplines, including Health & Social Care and Management. The Recruitment Excellence award is a new category introduced for 2018 which recognises employers who have attracted a diverse and high-quality apprenticeship workforce through new and innovative approaches to recruitment. 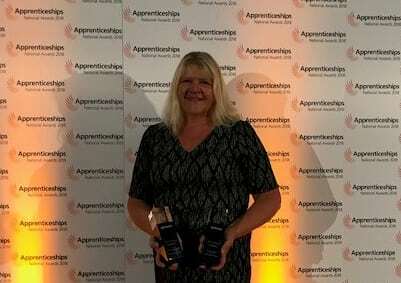 Caring Homes Group was selected by The National Apprenticeship Service to win the award as a company which makes a special contribution to the promotion and delivery of apprenticeships. Caring Homes Group works in collaboration with Qube Learning and has developed and launched a bespoke Assistant Care Practitioner Apprenticeship that is already helping with the recruitment and retention of nurses. The company is committed to workforce development, and is enhancing the senior care assistants role and promoting nursing as a vocation. The National Apprenticeship Awards Gala ceremony will take place on November 28.